The place has a cow over the door: what more could you need to know? 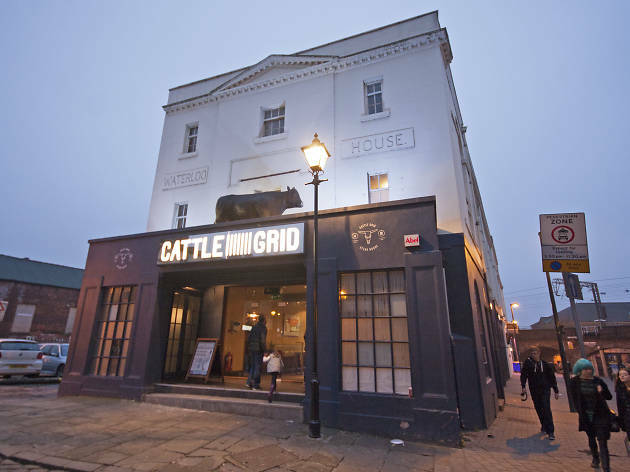 Cattle Grid on Assembly Street has everything that you’d want from somewhere so whole-heartedly devoted to meat. The Grid also serves thick-cut burgers, sticky barbecued ribs, crispy prawns and generous piles of skin-on chips which are equally well done. The minor players – the vegetables, the baked potatoes, the salad, the garlic mushrooms and even the desserts - are noticeably less well-executed than the stars of the show, which glisten, sizzle and ooze their juices onto the plate. Vegetarians – if any end up here – are offered a token mushroom burger and a Greek salad: they'll find better vegetarian fare elsewhere. Kids, though, are more than adequately looked after with smaller steak and chips, mac ‘n’ cheese, a third-rack of ribs and ice cream. All steaks (priced up to £22.95) are served with chips and a handful of watercress. Rump, sirloin and ribeye are all present and correct, with a hefty 16oz T-bone being the star of the show, while at 7oz the fillet is the smallest piece on the menu but has the kind of melt-in-the-mouth texture and presentational simplicity to awake your inner blood-thirsty caveman. Burgers are a little more elaborate with toppings including brie and caramelised onion, beetroot and goat’s cheese and the artery-quaking cheddar and bacon. For those less concerned about such coronary matters, Monday night is the Big Pig Party with unlimited ribs for £19.95. In-house resuscitation service not included. The typically dark, smoky and sultry interior of many steakhouses is eschewed for a bright interior with lots of windows, a white tiled bar and smart leather seating. 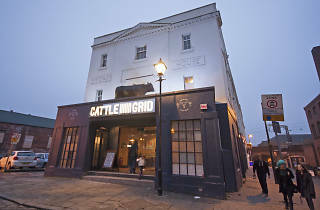 Overall, Cattle Grid is a fantasy land for the proud carnivores among us and while its initial rave reviews may have been mainly expressions of relief at the level of unpretentiousness and devotion to the flesh on offer, the place has rightly earned a reputation for reliably good cooking and a welcoming service.